The history of sociology overwhelmingly focuses on 'the winners' from the classical 'canon' - Marx, Durkheim, and Weber - to today's most celebrated sociologists. This book strikingly demonstrates that restricting sociology in this way impoverishes it as a form of historically reflexive knowledge and obscures the processes and struggles of sociology's own making as a form of disciplinary knowledge. 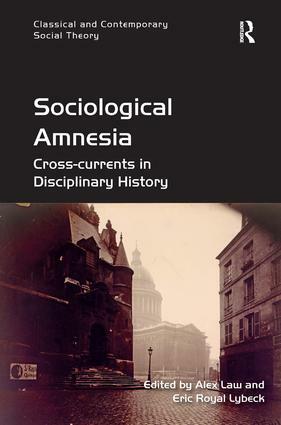 Sociological Amnesia focuses on singular contributions to sociology that were once considered central to the discipline but are today largely neglected. Chapters explore the work of illustrious predecessors such as Raymond Aron, Erich Fromm and G.D.H. Cole as well as examining exceptional cases of reputational revival as in the case of Norbert Elias or Gabriel Tarde. Through understanding the obstacles of recognition faced by female sociologists like Viola Klein and Olive Schreiner, and public intellectuals like Cornelius Castoriadis, the volume considers the reasons why certain kinds of sociology are hailed as central to the discipline, whilst others are forgotten. In so doing, the collection offers fresh insights into not only the work of individual sociologists, but also into the discipline of sociology itself - its trajectories, forgotten promises, and dead ends. Alex Law is Professor of Sociology at Abertay University, UK. He is the author of Social Theory for Today: Making Sense of Social Worlds, and Key Concepts in Classical Social Theory. Eric Royal Lybeck is completing his doctoral research in the Department of Sociology at University of Cambridge, UK.